Workers in Britain had the fourth-worst decline in wages in the European Union during the economic downturn, UPI cited figures from the House of Commons library as indicating. 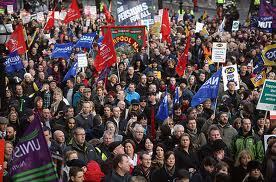 Wages in Britain fell 5.5 percent since mid-2010, the BBC reported Sunday. The only countries in the European Union with a bigger decline were Greece, Portugal and Netherlands. Across the European Union as a whole, wages fell 0.7 percent. Of those that saw an increase in wages were Germany with a 2.7 percent increase and France with a 0.4 percent increase. The government said it helped offset the increased cost of living by raising the tax-free personal allowance threshold to $15,500. “The economy is on the mend, but we’ve still got a long way to go as we move from rescue to recovery and we appreciate that times are still tough for families,” a Treasury spokesperson said.